The system is currently being piloted at homes in Brockworth and in the first week tenants have seen a marked difference. Severn Vale Housing asset and commercial director Michael Craggs said:”Working with Puredrive Energy makes perfect sense for us. The partnership has come at a time when Universal Credit is being introduced, and tenants, who are on benefits, are going to have to budget very carefully to make ends meet. “This system allows customers to store power from the solar panels on the roof into a small lithium battery in the house. It will also help them monitor their electricity usage and budget accordingly. “We are the first housing association in the South West to be working with an innovative energy company to save our tenants money. The installations have gone very smoothly and our initial findings have been very encouraging. We hope to roll the energy storage system out to a large number of our properties in the future”. 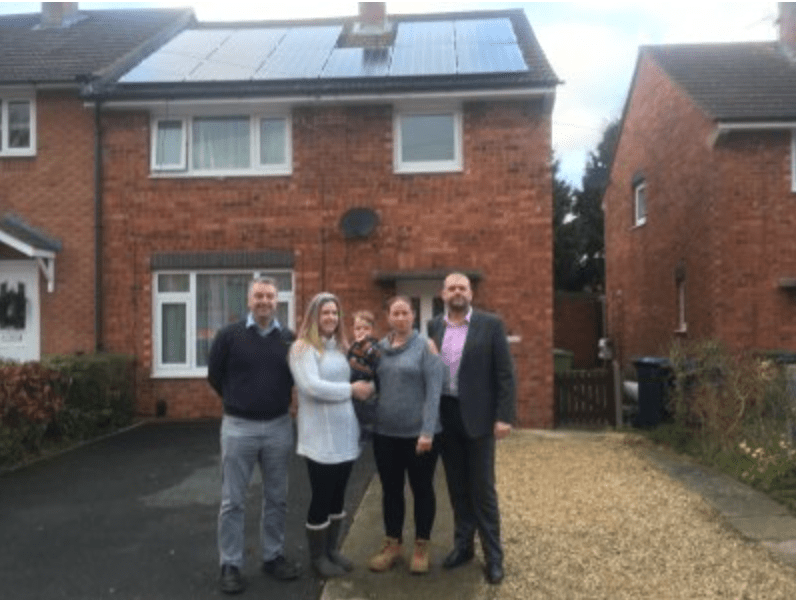 Helen Godwin who has had a system fitted on her home in Avon Crescent, Brockworth said: “I’ve noticed a marked difference in the first week. I know I have saved £10 already, and have not had to top up my pre-pay meter. Puredrive Energy managing director Mark Millar said: “We are delighted to be working with Severn Vale Housing. Working with leaders in Social Housing who share the same vision, and have the capability to implement positive change is key. “It’s one of our company goals to address and alleviate fuel poverty using our technology. Sustainable energy and cost savings are achieved through smart technology that maximises the use of green and renewable energy. Pictured left to right: Mark Millar, Puredrive, Julie McMahon, Rory McAlary, Helen Godwin and Mike Craggs, Severn Vale Housing. Puredrive Energy Hits Front Cover Of Local Paper Tewkesbury Direct With Solar... British Gas price rise unjustified, but energy price rises cant be avoided.